Biteface is one of the original sharks identified at Guadalupe, full of character, he has been seen every year since diving began at the Island. His name, predictably, comes from the massive amounts of scarring on his head. How does Biteface get his bites? There is a hierarchy amongst sharks and typically size is the deciding factor. When multiple sharks are around, smaller sharks will give way to larger animals in most cases. Should the smaller shark ignore this and get too close then the larger animal will often retaliate by biting the area around the gills and the head. Biteface due to his larger personality obviously attempts to punch above his weight on too many occasions and now wears the scars to prove it. He is a great shark to have around the boat and is also easily identified from out of the water because the tip of his dorsal fin is missing. On his day, Biteface is a leading showman that can stand alongside the best of the Islands “performers.” If he continues to grow in size, he has the potential to become one of Guadalupe’s’ all time greats. Share the Biteface the shark love on Facebook! Want to meet Biteface? Book with Shark Diving Xperts today! 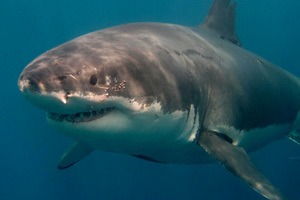 Thank you to the Marine CSI for providing information featured across our great white shark profiles. Bruce is the rock star of the shark world. He has been seen for over 15 years at Guadalupe and from being first spotted as a sub adult, he has gone on to become one of the largest male sharks you are likely to ever meet. 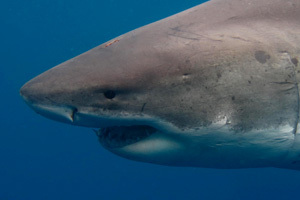 Lucy is another classic Guadalupe shark, a favourite of Shark Diving Xperts and is probably the most famous mature female seen here due to her unique and instantly recognizable broken caudal fin. 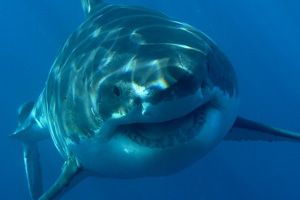 Perhaps the most famous, observed and photographed great white shark in the world, Shredder is a true legend of Guadalupe. No other shark comes close to the performance and display he puts on for our guests.